Widescreen laptops have changed the mobile landscape so much it's expected within the next 12 months you won't be able to buy a laptop with a 4:3 aspect ratio screen. 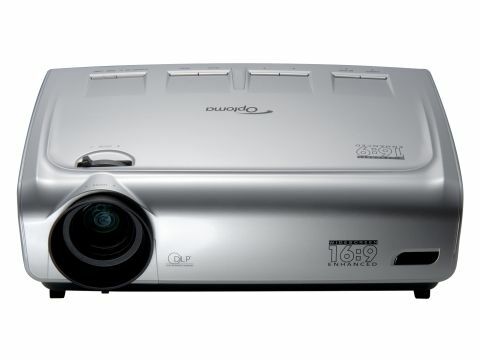 However, the data projector market has been slow to match this change, so much so that the Optoma EP1690 (£1174 inc. VAT) is the first business projector we've seen that supports the 16:9 format, hence the name. With a native resolution of 1280 x 720 pixels, it'll support HD as well as standard data. Your laptop may not accept the resolution by default, so you'll need to download a software upgrade from the website. We tried the projector on a couple of widescreen laptops and found it a 50/50 split, with half the machines booting up with no problem. The unit has an impressive finish and while the 3.2kg weight isn't ideal for mobile users, it's ideal for sharing between meeting rooms. On the back you'll find a full complement of connections, including DVI with HDCP support, which offers encryption of HD content over networks, as well as standard VGA-out, including a second port with SCART capabilities. Video and S-Video are also present, including audio- in and out, which can be used in conjunction with the 3-watt speaker. Image quality is impressive, courtesy of the 2500 ANSI lumens DLP chip with 2500:1 contrast ratio. User controls are easy to master, with primary functions doubled up in the onscreen menu and on the remote control, which makes this machine very easy to set up. With a 27dB rating and an airflow shielding system referred to as 'wind tunnel technology', this is a very quiet system and certainly the quietest we've heard in recent times. As the only machine currently of its kind, the EP1690 stands out, but we were also impressed with its capabilities, especially at what can be considered an aggressive asking price.